What on earth is a grey diamond, you ask? As diamonds are entirely made up of carbon, the black spots in them are dots of carbon that haven’t crystallized. 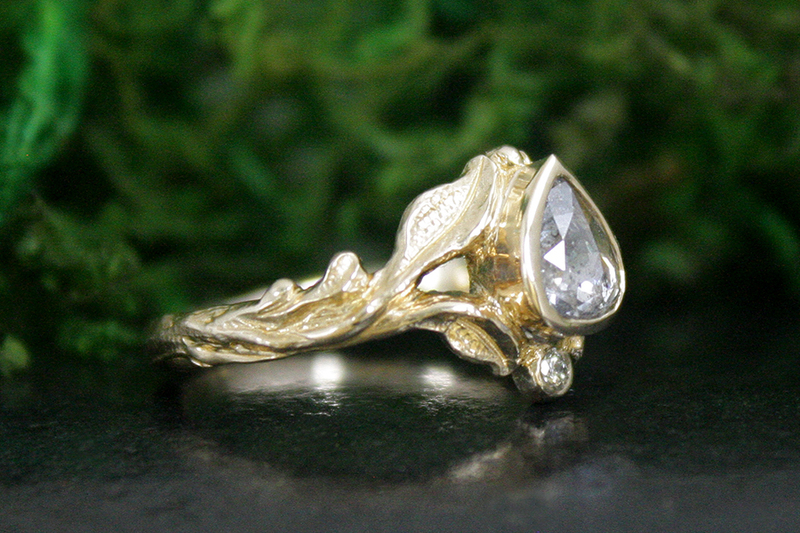 During the formation of the diamond, they are natural flaws that are part of its structure. They are mainly mined in Brazil, Russia, South Africa, and Australia. 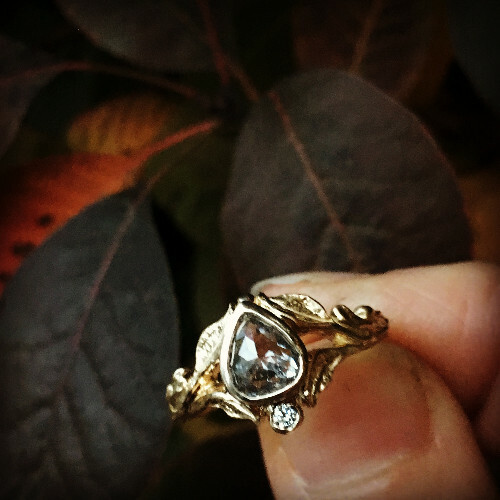 I have spent the last year hand selecting these dark beauties so I can now say I know exactly what I’m looking for to create a ring like the Drea Ring. 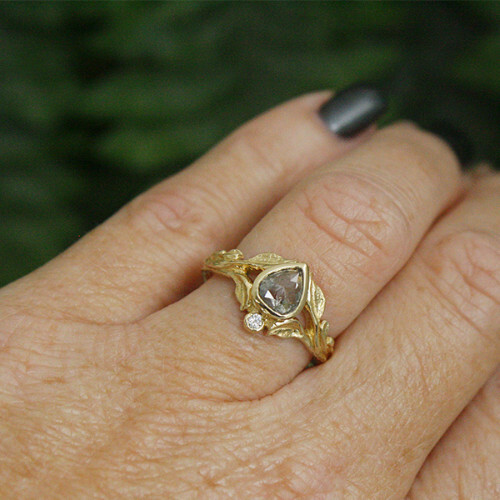 The pear shaped grey diamond in this ring has a shower of tiny little black carbon dots throughout, which lend to an overall grey colour. What makes them so spectacular, in my opinion, is the clarity. 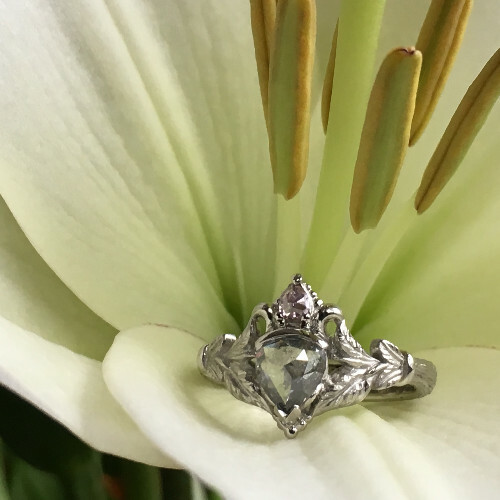 Once set the diamond will darken in shadow and have that beautiful glowing grey. 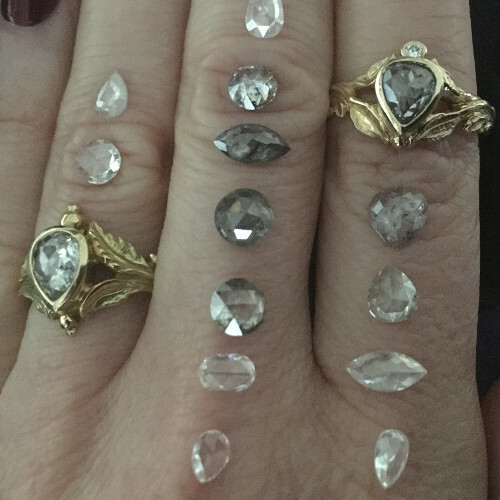 In this photo I have displayed a grey diamond beside the Drea Ring on my index finger to show you what it looks like when set. In the Willow Ring on the left there are only a few carbon flecks which give it the faintest grey shade. These diamonds range between .35c and .88 carats. The beauty of the grey diamonds is that they’re an illusion. They are SI diamonds meaning inclusions you can see with the naked eye. These black flecks of carbon set the mood and tone for that alluring dark smoky colouring. 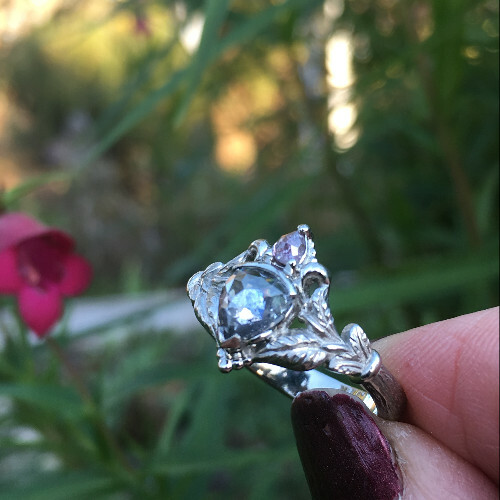 If you’re ready to inquire and begin the process of creating your own grey diamond ring, I would be delighted to create a dark and mysterious beauty for you! MESSAGE ME here to begin the process…I guarantee you will fall head over heels in love, just as I have!